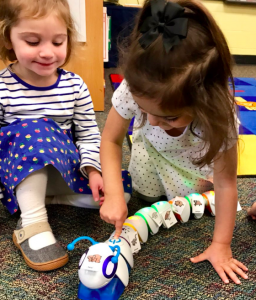 The preschool program at my school focuses on using the students’ interests and the world around them to guide classroom themes. Being from Michigan, we see very distinct seasonal changes. 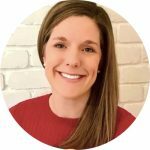 What animals do during each season is often observed by students and becomes part of the classroom discussion. This is how the unit below began. As each book was shared, we used the picture clues to identify what season the story takes place in. The children are encouraged as we read to say the repetitive parts of the story along with me. Furthermore, we made sure to identify the emotions that Bear is feeling. We discuss how they would feel if they were Bear. 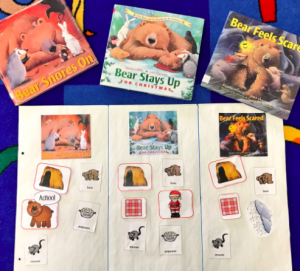 The students had been learning about bears and other animals that hibernate in the winter during their science classes. Therefore, I chose to focus on fiction elements and reading comprehension skills for this unit instead of comparing fiction and nonfiction text. I started by showing the cover of the book and asking students what they see. They usually point out that the bear is sleeping. If a student did not share the word hibernation (which they often do because of the background knowledge that they have gained from science) then I introduce the word. This unit is done during the week of Hour of Code. Therefore, I have incorporated coding in with sequencing. After discussing the cover, I pass out one piece of a Code-a-Pillar (a toy that teaches children the basics of coding) to each child. Taped to each piece is a picture of an event or character from the story. I keep the front of the Code-a-Pillar with Bear taped to it with me. As we read, when we find a child’s part of the story they add it to the Code-a-Pillar. In this way, we are sequencing the events. When we are finished reading and building, we review the sequence and identify what each part of the code will do when moving. Finally, we watch the Code-a-Pillar go! I want each child to have a piece of the story, which requires us to build two Code-a-Pillars while we read. I have access to six Code-a-Pillars, so after we complete the story we spend time playing with them. During this lesson, we began by reviewing Bear Snores On from the week before. Then we introduce the story Bear Wants More. 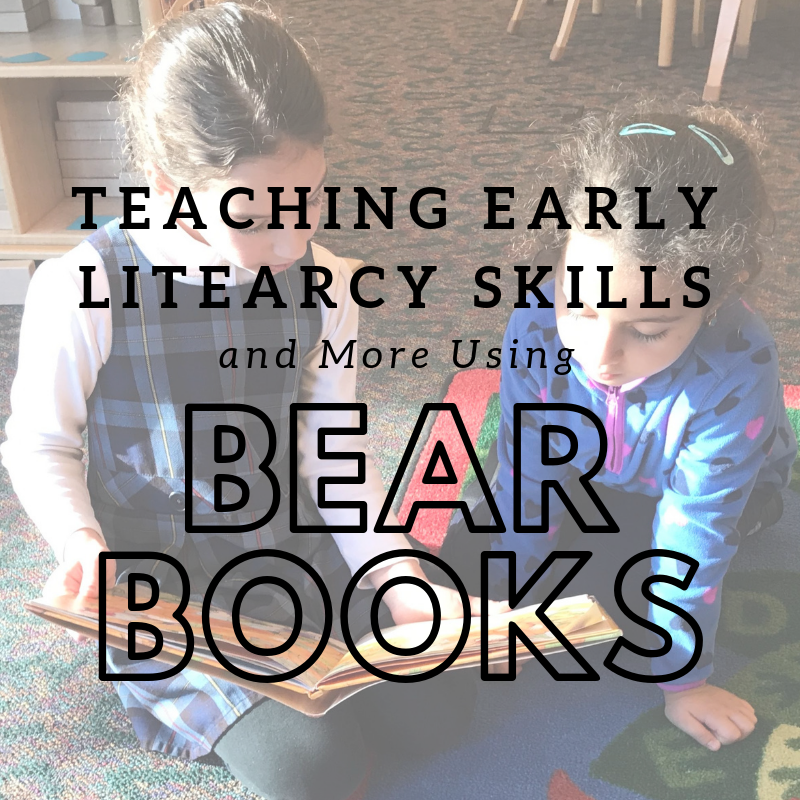 We discuss how the season is now Spring in the story and that Bear is waking up after hibernating. The kids notice that the story has the same characters. We spend time matching these characters up between the two stories. Additionally, we discuss how Bear is the main character. This book also works well to teach the setting because it changes throughout the story. Using picture cards we show the different places the story happens while we read. 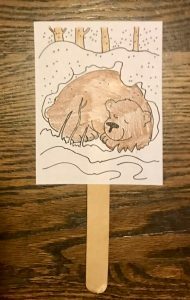 To end the lesson each child gets a bear puppet to color and take home. We also sing the following song. (and he will be hungry). For the final lesson, we read the book Bear Stays Up for Christmas. We start by reviewing the other two books we have read. We look at the cover to this book and discuss what we notice. Then we read the story and discuss the book. After reading the children sit in a circle. I show the students chart paper that is divided into three parts. Each part has a picture of the cover of the book glued to the top. Each child is then given a picture card from one of the three stories. They share their picture with a friend. Then together we look at each child’s picture. We decide where it should go. We have multiple pictures for the things that are in more than one book. For example, there are three students who have a picture of Bear. We glue these on in the correct spot and then review the things that are the same and different in each book. The poster is then displayed in the classroom. 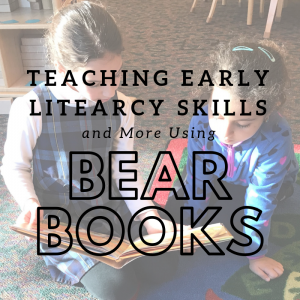 There are several Bear books so you can change them as needed. I have used Bear Feels Scared in the past as well. This was tied into a unit about emotions that the class was working on. This unit was taught to preschoolers with the focus being on exposure and not mastery of skills. My lessons are geared at supporting the classroom instruction. The students I teach receive further literacy instruction on a daily basis with their classroom teachers. Adding in nonfiction text examples would be easy with this unit. It could lead easily to research as well. Wilson, Karma. Bear Snores On. New York: Simon & Schuster, 2002. Wilson, Karma. Bear Wants More. New York: Simon & Schuster, 2003. Wilson, Karma. Bear Stays Up for Christmas. New York: Simon & Schuster, 2004. Wilson, Karma. Bear Feels Scared. New York: Simon & Schuster, 2008. Osborne, Cassie. “Bear Snores On Pack.” 3 Dinosaurs: Stomping Romping, and Roaring, 2018, www.3dinosaurs.com/printables/packs/bearsnoreson.php.